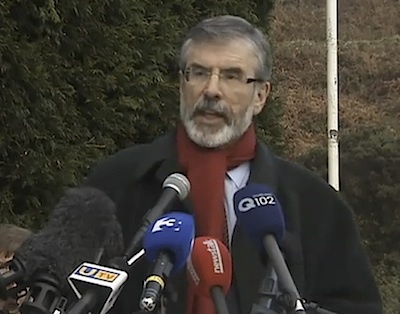 Party president Gerry Adams also called on all republican political parties, groups and individuals to join in the condemnations of the killing of a PSNI policeman by an anti-personnel device outside Omagh earlier this month. It remains unclear who was responsible for the attack, which produced the first PSNI casualty in over two years. With just four weeks before key local and Assembly elections in the North, it provoked an exceptionally vehement response by Sinn Fein and the other mainstream political parties. In press statements and speaking on RTE state radio this week, Mr Adams addressed the “tiny, unrepresentative factions” who he said continue to engage in armed actions. Mr Adams also attacked those who provide support to the breakaway IRA groups. “These groups are not the IRA and nobody should be under any illusion about that,” he said. Mr Adams also blasted his political opponents in Republican Sinn Fein, the 32 County Sovereignty Movement, the Republican Network for Unity and Eirigi, as well as independent republicans and local historical groups, who he said had “put their heads down”. “I’m not personally convinced that talking to these people will make any difference. I think they’re engaged in a futile campaign of violence,” he said. Mr Shatter said his only interest was “to support the gardai and the PSNI in a relentless targeting of these groups”. Sinn Fein First Minister Martin McGuinness said his republican rivals did not have the self-confidence to debate their position with his party. “We have been writing to these people, we have sent messages to these people. They’re not under any illusions whatsoever about our willingness to speak to them. There has been no deficiency on our side in terms of trying to make contact,” he said. He warned that armed actions “will continue over the next couple of weeks, and be designed to try to disrupt the democratic process”, he said. Des Dalton, president of Republican Sinn Fein would not talk to the “surrogates” of the British government. Eirigi general secretary Breandan MacCionnaith said Sinn Fein was trying to demonise his party.